After continental Europe and the UK Morrissey went on a tour of the European summer festivals. Of course this was a whole different experience than the previous British dates. Playing festivals meant playing in front of an audience composed in good part of people unfamiliar with most if not all of the material. It was quite different to the family affair type of gig Morrissey had just been doing in England. It should be noted that not all dates on this leg are part of festivals. Morrissey did a few regular concerts in between his festival appearances. What's most notable about the itinerary is that Morrissey played in many countries where he had never played before. Places like Turkey, Croatia, Hungary, Serbia or Iceland had never been given the chance to see Morrissey live. The audiences in those countries were generally extremely receptive. Boz had a double headed guitar in the colours of the Italian flag and another one with the shoulder strap in the flag's green-white-red. The bass drum was also in those colours on some early dates, while on a few others gigs the HAPPINESS drum specially made for the May 28 London Palladium show was used. Then Morrissey introduced a new drum skin, this one with the words PIGSTY on it. Whether he actually needed it or it was just a prop, Morrissey had a band-aid on his left temple on many of these dates. Personnel: Boz Boorer - guitar; Jesse Tobias - guitar and occasional cymbals; Gary Day - bass; Michael Farrell - keyboards, accordeon (also hit drum with mallet in "Life Is A Pigsty"); Matt Walker - drums. Because most of these dates were done on festival stages, there was no support act per se. Morrissey played after and sometimes before other scheduled artists. However Sons And Daughters opened for Morrissey in Montreux and Kristeen Young warmed up audiences for the three Italian and the two Karlstad dates as well as in Reykjavik and Brussels. Morrissey merchandise was sold at some of these festivals' merchandise stalls, but not all of them. For example there were none for sale at the Ruisrock Festival in Finland. The merchandise must have been more or less similar to what was reported for the recent British dates. Petula Clark - "I Who Have Nothing"
Max Bygraves - "Fings Ain't What They Used To Be"
Kristeen Young - "Kill The Father"
New York Dolls - "Pills"
The only additions reported were the Sundown Playboys' "Saturday Nite Special", the Pretenders' "Everyday Is Like Sunday" and an upbeat song with a chorus that went 'Take My Hands'. It is very possible that Morrissey couldn't have intermission music on some of these festivals dates. If or when he couldn't, he still walked on stage at the end of Jobriath's "What A Pretty" and exit music after the concert was Frank Sinatra's "That's Life". 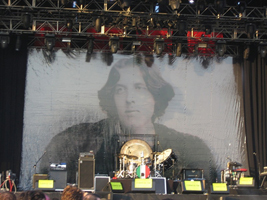 In Budapest a new backdrop was introduced, this one featuring Oscar Wilde. 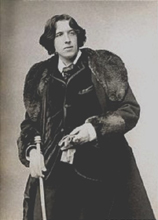 The original image was cropped to show only Wilde's head (view full original or in situ 1, in situ 2). The Oscar Wilde image was printed onto a transparent support so the image could be reversed, and it was on most dates, except in Serbia and perhaps one or two other places. By the end of this leg the backdrop had many creases from all the folding, unfolding and transportation. The stage could not always accommodate a backdrop, so in places like the Pinkpop festival, the Roskilde festival the Eurockeennes Festival, the Montreux Jazz Festival or Rome there was none. There was no backdrop either in Iceland, but this might have been because Morrissey decided to travel light and not carry it all the way there when he had to return to the continent just a few days later. The setlist length on this leg varied significantly. On some festival dates Morrissey was allotted only one hour and that limited his setlist to about 14 songs. When not limited in time, he would perform usually 17 or 18 songs, but he did play 20 songs in Dublin. Newest album "Ringleader Of The Tormentors" was represented by 11 of its 12 songs. The album's past and future singles - "You Have Killed Me", "The Youngest Was The Most Loved", "In The Future When All's Well" and "I Just Want To See The Boy Happy" - were played on all dates or almost. "I Will See You In Far Off Places" was also played in every set. 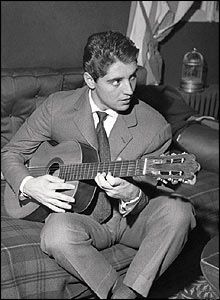 "At Last I Am Born", "To Me You Are A Work Of Art", "I'll Never Be Anybody's Hero Now" and "Life Is A Pigsty" were played on most dates, but dropped here and there for variety's sake or because of time constraints. "The Father Who Must Be Killed" was played 4 times and "On The Streets I Ran" once only. The only song from this album which was never played was "Dear God Please Help Me". It was actually attempted by Morrissey in Rome, but stopped after a few lines. The song would be a regular feature in Morrissey's setlist on the upcoming leg of the tour. Three of the album's b-sides were played on and off. The fan favourite "Ganglord" was included in about two thirds of this leg's setlists, "Human Being" in about one quarter and "If You Don't Like Me, Don't Look At Me" was only played 5 times. The latter had actually never been performed live before its debut in Sweden. Previous album "You Are The Quarry" was represented by its first three singles "First Of The Gang To Die", "Irish Blood, English Heart" and "Let Me Kiss You", all performed on every date. The album's deluxe edition supplied two songs: "My Life Is A Succession Of People Saying Goodbye" had been played more regularly on past legs, but only twice on this one, and "Don't Make Fun Of Daddy's Voice" was introduced two thirds into this festival season and remained a setlist regular thereafter. Morrissey's solo back catalogue was barely represented on this tour, but perhaps slightly more on this leg than earlier in the year. "Maladjusted"'s "Trouble Loves Me" which was played quite regularly earlier in the year was now only played 5 times. "Southpaw Grammar"'s "Reader Meet Author" was played once only, an oddity in the middle of this 3-month trek. "Vauxhall & I"'s "Now My Heart Is Full" was played three times near the end and "Your Arsenal"'s "We'll Let You Know" 6 times. Neither of the latter two titles had been played before on the Tour Of The Tormentors MMVI. The Smiths' back catalogue was better represented than Morrissey's solo back catalogue. "Girlfriend In A Coma", "How Soon Is Now?" and "Panic" were regulars throughout. The latter song was only dropped once, on a date when three songs were introduced live for the first time. "Stop Me If You Think You've Heard This One Before" was neglected on the first half of this leg, then played 10 times in the second half. "Still Ill" provided variety here and there, it was played 5 times in all. Finally "Last Night I Dreamt That Somebody Loved Me" made a surprise return one third into the leg, it was played two nights in a row, then dropped for the rest of the season. Finally a new live addition must be mentioned. A cover of Roxy Music's "Street Life" was debuted on the second Swedish date. It was played once again on the following date in Oslo, then dropped forever. The song was never recorded for release by Morrissey and wasn't very well received on either of these two performances. Morrissey has since mentioned in interview that he would never perform it again. Here is the number of times each song was performed on this leg, in descending order of frequency. This is based on 27 concerts. In "In The Future When All's Well", Morrissey always sang "something must have gone wrong" instead of "... right". In "You Have Killed Me" he sometimes sang "Pasolini is me / Fellini I'll be" or "...Fellini you'll be". In the next verse he didn't do "Tony Visconti is me" as much as earlier in the year but still sang "Anna Magnani you could never be", "...you will never be", "...you will always be" or "...I wish you'd be". The change of a line to "Piazza Cavour, what the hell is my life for" became standard and Morrissey sang "Til you came with the key and you did okay but" here and there. Near the end of this leg he introduced the extension "I entered nothing, and obviously nothing entered me..." He also often playfully improvised minor one-time-only changes. In "I Will See You In Far Off Places" he usually changed a line to "It's so easy for us to stand here together, but it's so hard for the flesh to combine" as he had done on previous legs. On a few performances at the end of the leg, he changed "so why then do I know" to "but in my heart I know". In "At Last I Am Born" the man usually sang "vegetarians know" instead of "vulgarians know" and once in a while replaced "historians note" by "historians write this down" or "vulgarians note". The change of "difficult child" to "miserable child" still happened on and off. However during the latter weeks of this leg, he often changed that part to "fat little child". In "Ganglord" Morrissey never sang the "Ganglord, there's a clock on the wall" verse twice the same. He would switch "there's a clock on the wall" for "the clock on the wall" or vice versa and/or switch "making fun of us all" with "makes a joke of us all". He sometimes reversed that verse's two halves, or repeat the first one twice. In "Still Ill", which came with a longer intro than most performances from the Smiths days, Morrissey always sang "England's a swine and it owes me a living" and "there are brighter sides to life and I should know because I see them very very often". In "I'll Never Be Anybody's Hero Now" Morrissey usually made a minor change to "haves cannot stand we have-nots" and sang the final line as "it only hurts me because it's true" and sometimes even "this only hurts me because it's true". In "Trouble Loves Me", Morrissey made many minor lyrical changes, including "somebody hold me" and "somebody kill me" instead of "otherwise hold me" and "otherwise kill me" He also sometimes sang "to chide me but never to guide me" and "which is only the way or "which is exactly the way it should be". But more importantly the song was always preceded by a different piano intro of a well known local song. See individual dates for details. In "Stop Me If You Think You've Heard This One Before" Morrissey sang the lines "so I drank one, or was it four? ", "he broke my knees" and "and then he really laid into me" the way they had originally been written instead of the way they were recorded and released. 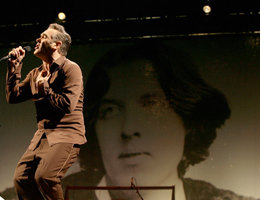 The live change "I still love you only slightly, only slightly more than I used to, my love" done earlier in the year was only done a few times here as Morrissey returned to the standard "only slightly less" in most performances. "Reader Meet Author" was adapted to the new century by the change of one line to "The year 2000, it hasn't changed anyone here". Morrissey also sang "you hear the way this sad voice sings", which probably implied that the author in question listens to Morrissey. He playfully also sang " you'd be the first away why? because you're that type" and "Have you ever escaped from a shipwrecked life? yeah..." The final lines in "On The Streets I Ran" were changed to "take Boz, Matt, Gary, Jesse, Mike - just spare me". In "Human Being" Morrissey sometimes changed the line "on the best lovin' you've had yet" to "on the best lover you can get" or "on the worst lover you can get". In "Now My Heart Is Full" he sometimes did and sometimes didn't drop the word 'puny' in "just some rain-coated lovers' puny brothers", and sang "Tony Franciosa raised to wait". In "Don't Make Fun Of Daddy's Voice" Morrissey sometimes followed the line "...and it can come from the strangest direction" with a roar of "Hey kid! Hey you! ", "Come on kid, you!" or something similar. In "We'll Let You Know" Morrissey made some - but not all - of the earlier live changes. He sang "At heart, what's left, of course we know" and "that you wouldn't want to know, and so on..." He also introduced a new one: "You wonder how *I*'ve stayed alive til now..." or even "*I* wonder how *I*'ve stayed alive til now..." More remarkably the flute line was changed to a slightly different one. Morrissey suggestively changed a line in "Let Me Kiss You" to "I heard that you'll try anyone twice" and as he sang "you see someone that you physically despise", he often teased the audience by removing his shirt and caressing his torso. Trumpet was still added during the bridge of the latter song. On the final few dates of this leg a line of trumpet was also added to the bridge in "First Of The Gang To Die". In a few performances of "How Soon Is Now?" Morrissey changed a line to "I am the son and the heir of a shyness that is crippling and vulgar". The song's intro was extended on a few occasions with a few classical bars on the piano. Its outro was usually extended with drummer Matt banging on the gong and on a diagonally set bass drum while Jesse posed as rock god and improvised guitar lines. "Life Is A Pigsty" was also extended at the end, but with sad and beautiful piano music played by Michael. On a few select dates (at least Rome, Benicassim, the second V Festival date, Dublin and Brussels) that piano music was Auld Lang Syne, a beautiful echo to the way the Smiths' "Asleep" ends. At the beginning of the latter song Boz played glasses filled with water which he would sometimes subsequently drink. Near the end of it Morrissey sometimes replaced "I'm falling in love again" by "I am in love again". The performances of "In The Future When All's Well" from both appearances at the V Festival (August 19 Staffordshire and August 20 Chelmsford) were made available as official downloads as soon as they were performed. They counted towards the chart performance of that song which was physically released as a single during the week that followed. Fans interested in visual souvenirs of this period in time are spoiled. Many festival appearances were filmed and broadcast locally in the weeks or months that followed the event. This means that many great quality video recordings have made it onto DVD bootlegs. A few gigs were also filmed from the audience and although they are not as visually interesting, they may be of interest to collectors and people who attended. 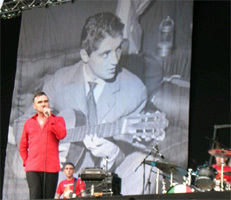 The best souvenir for the summer of 2006 is arguably the television broadcast of Morrissey's appearance at the Rock En Seine Festival in France. The man's performance was one of the best of the summer, the setlist featured most fan favourites played at the time, and the filming was very dynamic and lively. The recording features good shots of Morrissey's musicians at work and unlike other festival footage, it doesn't waste too much time with pan-shots of the crowd. Collectors should be careful that they are getting the broadcast and not an inferior 12-song audience recording which is also out there. Television broadcasts of Morrissey's appearances at the Rock am Ring Festival in Germany, the Pinkpop Festival in Holland, the Eurockeennes Festival in Belfort (France), the SRC Salata Open Air Festival in Zagreb (Croatia), the Exit Festival in Serbia, the Benicàssim Festival in Spain or the Øya Festival in Oslo (Norway) are also excellent alternatives. They all feature the full or near-full set. They vary in setlist content and performance quality. See individual dates for more details. Fans interested in the Pinkpop festival should make sure they are getting the television broadcast and not the inferior video webcast. Similarly, collectors interested in the Benicassim festival appearance should be aware that there is also a fan recording out there. It is obviously of inferior quality to the television broadcast, but on the up side it doesn't lack the three and a half songs that weren't shown on television, and it doesn't have the tv host comments in between songs. A television broadcast of two songs plus an interview from the second V Festival date as well as five songs from a short webcast of Morrissey's appearance at the Roskilde Festival in Denmark are also sometimes found tagged at the end of other sets from the summer of 2006. Completists will also be interested in audience recordings of Morrissey's sets at the Heineken Jammin' Festival in Imola (Italy), the V Festival date in Chelmsford and the Marley Park show in Dublin (Ireland). The latter is actually for completists only, as the recording is very shaky and tinny-sounding. Three versions of the V Festival appearance are out there, one featuring the full set, another only 7 songs in similar quality, and the third is a montage of the other two. Impressively, recordings of about one half of the concerts of this section are circulated in excellent audio quality at this point in time. These are usually from radio, television or internet broadcasts. The other half is composed of inferior sounding audience recordings. This leaves only six dates out of the total 27 for which no significant bootleg is available at this point in time. Radio broadcasts from the Benicàssim Festival in Spain, Karlstad in Sweden, the Paredes De Coura Festival in Portugal and the FM4 Frequency Festival in Austria are all circulated in excellent quality and feature complete or near-complete sets. The Karlstad recording is particularly sought after for one of only two performances of Morrissey's cover of Roxy Music's "Street Life". The Benicàssim recording has a very moving performance of "Life Is A Pigsty" with the "Auld Lang Syne" outro. To the above can be added a radio broadcast of the Roskilde Festival in Denmark, but this one only features seven songs so collectors may prefer the very good audience recording of the complete set. A radio recording of the Dublin concert is out there, but only about two thirds of the concert was broadcast. A radio recording of the first V Festival date is circulated, but its quality is significantly below what is expected of a radio broadcast. This also only features about two thirds of the setlist so collectors might prefer an audience recording of the full set mentioned further down this list. Audio from television broadcasts or from DVDs produced from a television broadcast also make excellent audio bootlegs. In this category fans might want to look for such recordings of Rock am Ring festival in Germany, the Pinkpop Festival in Holland, the SRC Salata Open Air Festival in Croatia, the Exit Festival in Serbia, the Benicàssim Festival in Spain, the Øya Festival in Norway or the Rock En Seine Festival in France. The latter features a great version of the lesser played "Now My Heart Is Full". The television audio of the Benicàssim concert is actually more appealing than the radio broadcast mentioned above because it has fewer and less annoying DJ interventions. Fans who can't stand DJ interventions will have to fall back on the audio from a fanmade video recording (mentioned further down). Television audio is also circulated for the Eurockeennes Festival and the second V Festival appearance, but only for the few songs that were broadcast (three and two respectively). Fans might prefer the full audience recordings mentioned further down. Webcast audio is available for portions of Morrissey's appearances at the Roskilde Festival in Denmark and in Dublin (Ireland). In the latter case the radio recording mentioned above or an audience recording of the full set might also be more appealing to collectors. What's left for completists are audience recordings. Good ones of near or near-complete sets can be found for the Eurockeennes Festival , Budapest, Turku (Finland), Rome, the first V Festival date and L'Ancienne Belgique. A recording of Codroipo is also out there, but the quality is clearly below average. The audio from fanmade video recordings of Imola (Italy), the Benicàssim Festival in Spain, the second V Festival appearance and Dublin (Ireland) are other options. These sound average at best, more often than not they are rather tinny.